AST WEEK, POPE SAINT John Paul II’s Letter to Artists was discussed. As art expresses truth in its beauty, Saint John Paul asserted that the Church needs art. A tribute to John Paul II’s “Letter to Artists”, as read by students at John Paul the Great Catholic University. This video was posted in April 2014, to commemorate his canonization to sainthood, and as a gift to Christian artists throughout the world. 1 • What role does art play in our interior and exterior prayer life? 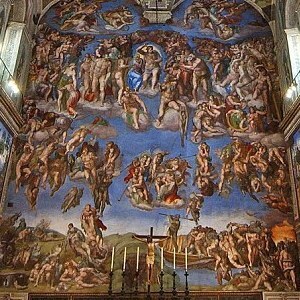 2 • Therefore, What implications does beauty and art have for the liturgy? 3 • E.g., What roles do music, architecture, and vestments play in our prayer? 4 • Do art and beauty require intricacy and complexity? 5 • What implication does the subjective nature of judging beauty, and therefore the experience of art, have on corporate prayer? 6 • Saint John Paul stated in this letter: “The ‘beautiful’ was thus wedded to the “true”, so that through art too souls might be lifted up from the world of the senses to the eternal.” (§7) As truth is objective, is there a standard for what is beautiful? Pray always and be unceasingly inspired! Sacred Art in service to God and his people is a great calling—one that is encouraged by a great saint.